This is about creating a single page web app using an ASP.NET Web API 2 Service which stores the data via Cache Manager. 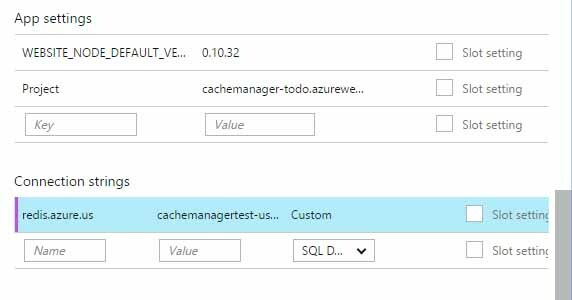 I will explain the service implementation and usage of Cache Manager, and also discuss how to host the newly created site on Azure and how to configure Azure's Redis cache. 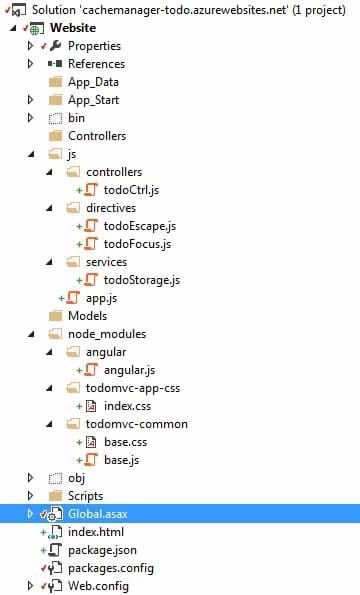 To implement the site, I will use an existing AngularJS based example from todomvc.com. All credits for this part of this sample site goes to them of course. You can see the sample site in action on cachemanager-todo.azurewebsites.net or browse the code on Github. With this simple app, the user can add new todos, edit existing ones, delete them and set them to completed state. There is also a delete "all completed" function. 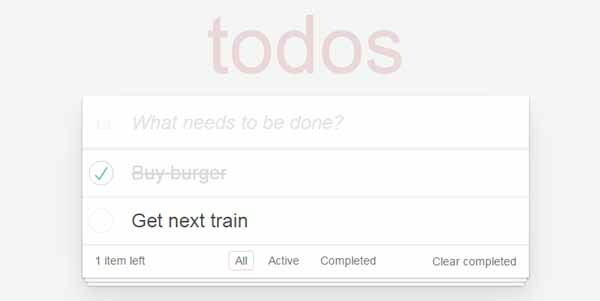 Post(todo) - Creates a new todo, assigns a new id and returns it. Hint Don't worry, you can simply get the full source code of this sample from the Github repository. I also installed some additional nuget packages, CacheManager packages, Unity and Json.Net. Let's add the Todo Model to the solution, the model has three properties: Id, Title and Completed. Our service should use Cache Manager to store and retrieve the todo items. To make the Cache Manager instance accessible by the controller, I will use Unity as IoC container. This could be done in many different ways of course, use whatever IoC container you prefer. In Global.asax during app initialization (Application_Start), we just have to create the IUnityContainer and register the Cache Manager instance. To have Unity inject the Cache Manager instance into our controller every time the controller gets instantiated by the framework we have to also tell the Web API framework to use Unity as the dependency resolver. Let's create the service. I will let MVC scaffold a full CRUD Web API controller. The generated code will be using string as types, we'll have to change that to our Todo model. We know we have to retrieve all and remove subsets of the todos. We could store the Todos as one list but this is usually not very efficient if we think about scaling and performance. I'll add a simple private property to retrieve the list of ids. If the key is not present, I'll add an empty array into the cache. This is necessary because we want to call Update later on, and if there is no cache key to update, the method doesn't do anything! I'm using Add in this case because it adds the value only if it is not already present to prevent eventual issues in distributed environments. // key to store all available todos' keys. We can use the AllKeys property and iterate over it to return the list of Todo´s. Creating a new item is a little bit more complex because we store all the available ids on a separated cache key and to create new items, we have to "generated" unique ids. To do this safely, even with distributed caches, we can use the Cache Manager's Update method. If we would use Put or Add instead, we would run into concurrency issues with multiple clients using the same id for new items. As discussed in the article about the Update method, the Action you pass in might be called multiple times depending on version conflicts. We will always receive the "latest" value though, in this case obj. If a version conflict occurs during the update process, our changes will be discarded and the Action runs again, this means we will not add the new id multiple times, only the Max value will be different on every iteration. At the end, we can set the Id property of our Todo, finally Add it to our cache and return it. To delete all completed Todo´s, we'll have to iterate over all existing Todos, check the Completed state and call Delete by id. Delete by Id is similar to Post, we also have to update the key holding all the Todos´ ids. Same thing here, we'll use the Update method to ensure we work on the correct version of the array. As you might have recognized, in the "Setting up Cache Manager" section of this article, I only specified one in-process cache handle. This would mean that our Todos are stored in memory only and will be flushed whenever the app gets restarted. To persist our Todos, we could use some distributed cache like Redis or couchbase. With Cache Manager, this is extremely easy to change. Just a few lines of configuration and there are no changes needed in our API controller! The configuration now has two cache handles! A "first level" in-process cache, and the "second level" distributed cache. This way, we can reduce the traffic to the Redis server which will make our application a lot faster. If we now host this site on Azure for example, we can change the configuration slightly and use a connection string instead of hard coded connection parameters. We can also use the Cache Manager's backplane feature, to keep the configured first level in-process cache in sync. The connection string itself must contain at least the host, SSL being set to true and the password being set to one of the Redis Access Keys provided by the portal. And that's it, you can see the sample site in action on cachemanager-todo.azurewebsites.net and browse the code on Github.